Classic navy and white is perfect for year round events! Solid navy blue shorts button on to white short sleeve shirt at waistline. Shorts have elastic back, for a comfy fit. Navy, light blue, and white smocked yoke. Navy piped collar and sleeves. Pearlized front button closure. Easy care, washable poly/cotton blend. Classic navy and white is perfect for year round events! 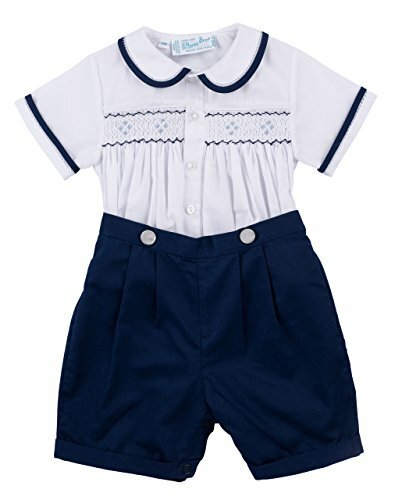 Solid navy blue shorts button on to white short sleeve shirt at waistline. Shorts have elastic back, for a comfy fit. Navy, light blue, and white smocked yoke. Pearlized front button closure. Navy piped collar and sleeves. Easy care, washable poly/cotton blend.